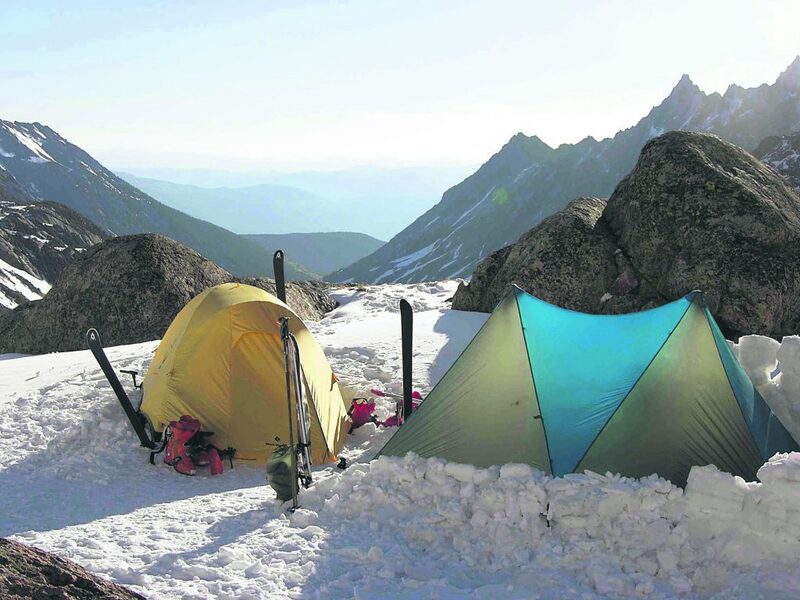 With its ski mountaineering culture, what could Olympic inclusion mean for Summit County? Ski mountaineering competitors skin uphill during the "Rise and Shine Rando Race Series" Tuesday morning, Nov. 14, at Arapahoe Basin. Summit Skimo Club and U.S. 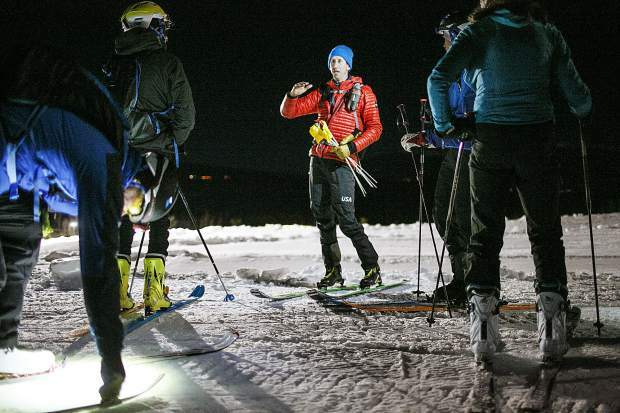 Ski Mountaineering team member Teague Holmes leads an advanced group during a clinic session at the Frisco Adventure Park Thursday, Nov. 30, in Frisco. Ski mountaineering competitor Mark Koob takes off the skins from the skis to go downhill during the race Tuesday morning, Nov. 14, at Arapahoe Basin. 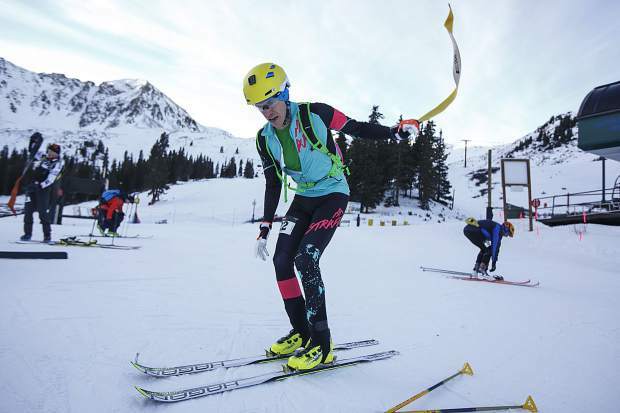 Ski mountaineering competitors skin their way uphill during the "Rise and Shine Rando Race Series" Tuesday morning, Nov. 14, at Arapahoe Basin. Kati Campbell shuffles her way uphill during a Summit Skimo Clinic at the Frisco Adventure Park Thursday, Nov. 30, in Frisco. 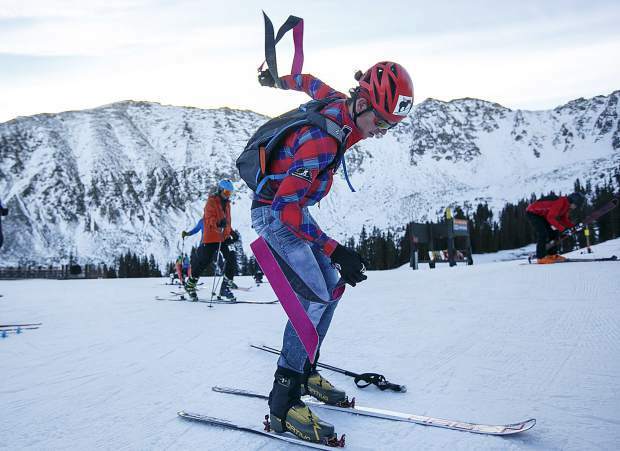 Ski mountaineering competitor Chris Carr transitions to downhill mode while taking off the skins attached to the skis during the "Rise and Shine Rando Race Series" Tuesday morning, Nov. 14, at Arapahoe Basin. 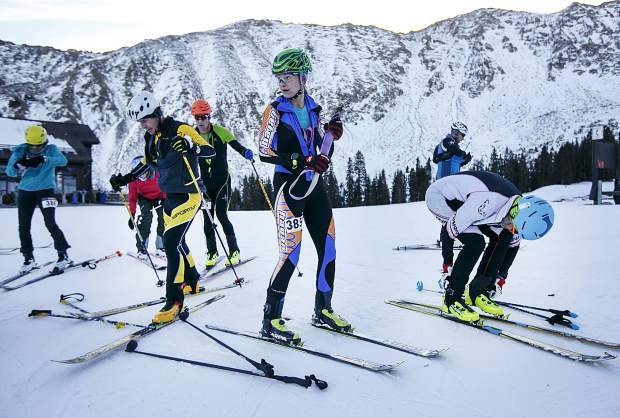 Ski mountaineering competitors transition to downhill skiing mode during the "Rise and Shine Rando Race Series" Tuesday morning, Nov. 14, at Arapahoe Basin. Summit Skimo Clinic attendees skin uphill at the Frisco Adventure Park Thursday, Nov. 30, in Frisco. As he shuffles his downhill skis mere feet away from the president and head coach of the United States Ski Mountaineering Association, 2-and-a-half-year-old Logan Zander does his best ski mountaineering impression inside the warm confines of the Frisco Adventure Park’s day lodge. 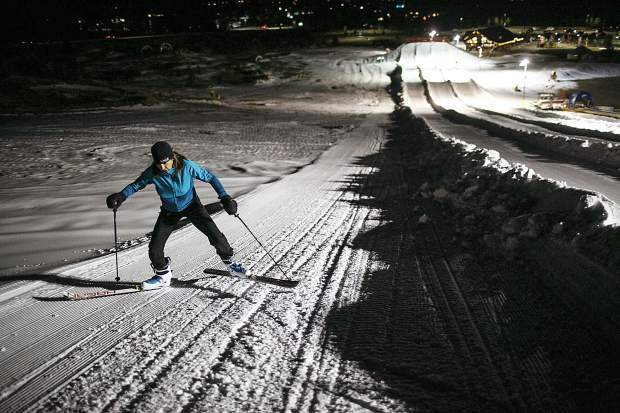 Outside, under the lights near the town’s tubing hill, a few dozen Summit County locals test out alpine touring skis on what is the equivalent of a ski mountaineering practice course as part of a Summit Ski Mo Club clinic. 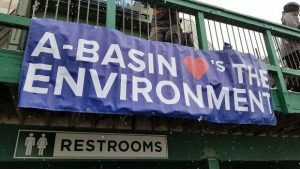 For Joe Risi, the race director of the Colorado Ski Mountaineering Cup Series, the adventure park is the perfect training ground for this young sport he’s grown to love. 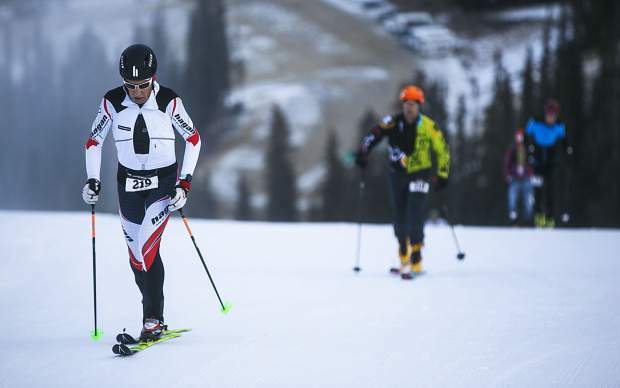 And much like the other ski mountaineering, or “ski mo,” enthusiasts in the room, Risi is eager to see if and when the sport he loves reaches what is the zenith for a winter sport: inclusion in the Olympics. Based here in Summit County, USSMA head coach Joe Howdyshell of Breckenridge and president Ram Mikulas of Dillon are taking all the necessary steps to get the sport into the Olympics. Howdyshell even adds that he’s heard there’s as high as a 40 percent chance ski mountaineering will make the jump from youth Olympics to the full-on games by the 2022 Beijing event, though 2026, he says, is a more realistic possibility. As such, Howdyshell belives of the nine local high schoolers he coaches as part of the Summit Endurance Academy, including a teenage American and teenagage Spaniard who competed at the world championships last year, maybe some of them will represent Team USA or other nationas in ski mountaineering at the 2020 youth games in Switzerland. Then, come 2022 or 2026, maybe they’ll be Olympians as well. And, Tim Zander supposes, maybe a couple of decades down the line young Logan may be an Olympian too. After all, Tim plans to start Logan on ski mountaineering when he is 10 years old. That’s eight years from now, in 2026, about when Mikalus and Howdyshell feel it’s most likely for their sport to become Olympic. So while watching his son as his wife and former competitive ski mountaineer Kate Zander feeds Logan’s little brother, 7-week-old Rowan, Tim ponders the possibilities for Summit County youth like his sons. Despite their lofty dreams and the grassroots efforts they are putting in since they effectively took over USSMA in the past couple of years, Howdyshell and Mikulas remain patient about ski mo becoming Olympic. 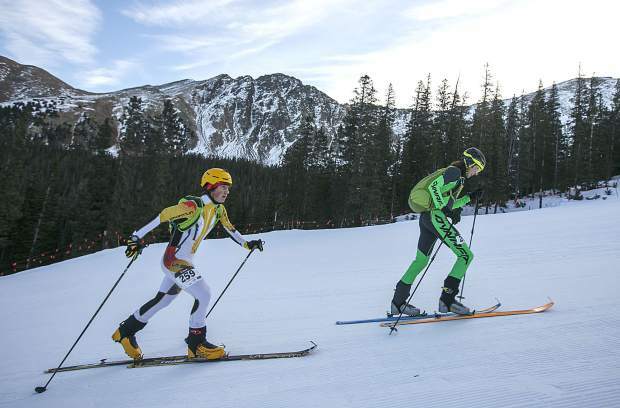 For one, the sport is still very young here in the U.S., as they estimate around 1,000 athletes are competing nationwide while closer to 2,000 have tried a ski mo race. With that, Howdyshell says there are about 37 athletes currently part of the USSMA national team program, ages ranging from 16 to 53. Of that, he estimates seven live in the county and 25 live in Colorado. 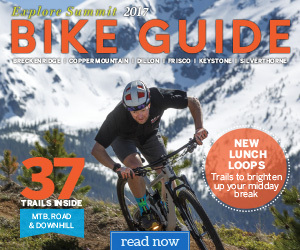 He also lists Crested Butte and the Salt Lake City area as the other two primary hubs for the sport. The U.S. still has a ways to go to catch up to international ski mountaineering juggernauts such as Italy, Spain, France and Switzerland. But Mikulas and Howdyshell said the national ski mo federations for each of those more established national teams are elated to see the sport grow and become more organized in the U.S. But what will it take for ski mountaineering to be a slam dunk for the Olympics? Howdyshell brings up the almighty dollar, saying that the International Olympic Committee is primarily worried about how well a new Olympic sport can be televised. With the advent of cameras attached to drones able to televise above mountainous terrain, Howdyshell feels the sport easily checks that box. Rather, the concern Howdyshell and Mikulas have about ski mo is whether or not the IOC sees it as a sport that can sustain and support its own World Cup-level events. 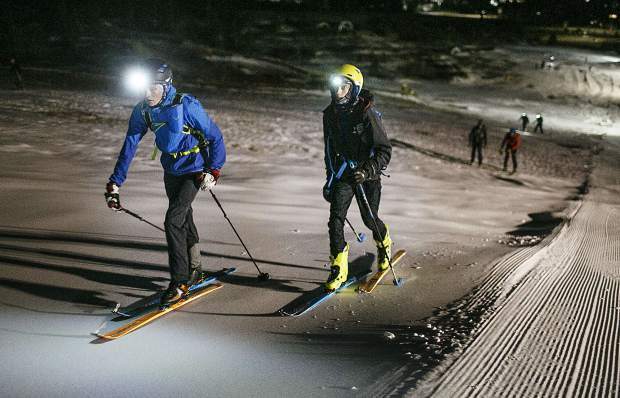 The International Ski Mountaineering Federation is chipping away at that IOC recognition. The first step was in August 2016, when the IOC officially acknowledged the ISMF as an international federation. The second step comes this month, as the ISMF will work in conjunction with the Chinese Ski Mountaineering Federation to hopefully impress the IOC with an Olympic-caliber 2018 ISMF Ski Mountaineering World Cup event in China’s Wanlong, Hebei province. If and when that goes well, back here in the U.S. Mikulas said his federation is currently updating its bylaws to be compliant with the United States Olympic Committee’s standards. The last question Mikulas and Howdyshell have in the back of their collective minds is what version of their sport the IOC would bring into the Olympics. The duo is well aware the IOC has shaped down sports in order to fit their mold, such as bringing rugby into the games via the shorter, smaller Rugby Sevens version of the sport. There has been similar chatter surrounding if and how lacrosse could become an Olympic sport, as senior U.S. lacrosse officials recognize an Olympic version of their sport may resemble something more similar to an outdoors version of the intimate box lacrosse game popular in Canada. The one thing ski mountaineering has going for it that lacrosse doesn’t, however, is that not many international teams can compete with the United States, Canada and Iroquois Nation at lacrosse’s highest international level. 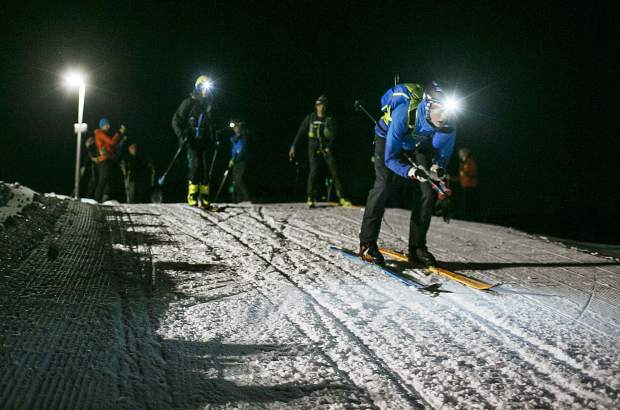 The international — especially European — ski mountaineering community, on the other hand, is waiting for the U.S. to play a bit of catch up. If and when the Americans do, Howdyshell wonders what kind of an Olympic ski mo race Summit County youngsters like Logan may partake in. Whatever version of their spot becomes Olympic, Howdyshell and Mikulas think they have the right thing blossoming here in Summit County. And they feel that has occurred due to a confluence of athletes from other sports looking for a new wintertime outdoors challenge combined with the attractive multi-discipline nature of ski mountaineering. 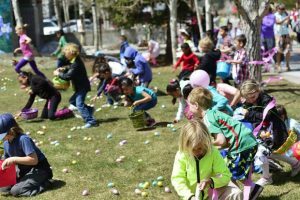 This story originally published in the Summit Daily in December 2017. 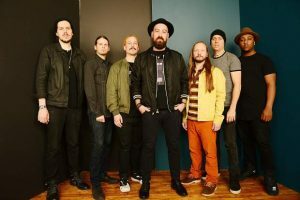 It appeared in the Explore Summit Spring magazine 2018.